Founded by Susan Clark in 2016, Radnor was born from a desire to foster a community around meticulously handcrafted products. 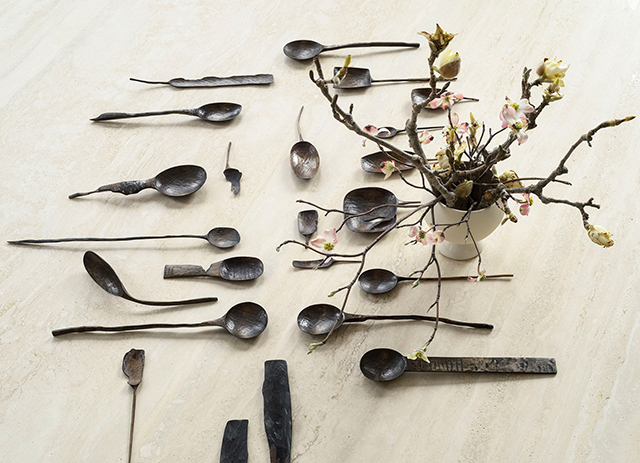 With a belief that being surrounded by such objects significantly improves quality of life, Radnor seeks out and supports designers who create unique, mindfully-made objects, while also working collaboratively with designers to create exclusive product lines. Some time ago I came across their unique pieces and following on Instagram, I saw that they had an upcoming project involving an exhibition in New York. 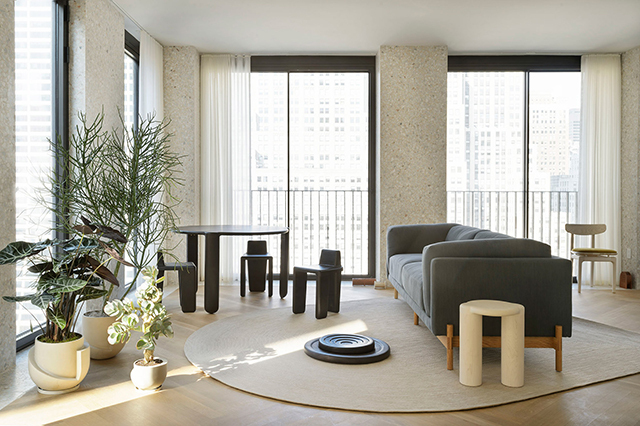 Now launched, it is taking place at The Bryant, in a luxury condominium by David Chipperfield Architects that overlooks Manhattan’s Bryant Park. 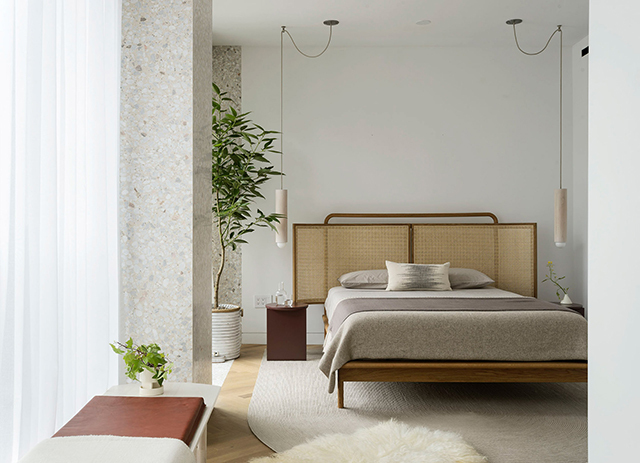 Susan Clark has transformed the two-bedroom residence into Material Interiors, an exhibition that launches three collections of exclusive Radnor-made textiles and furniture designed in collaboration with Bunn Studio and Adam Rogers. 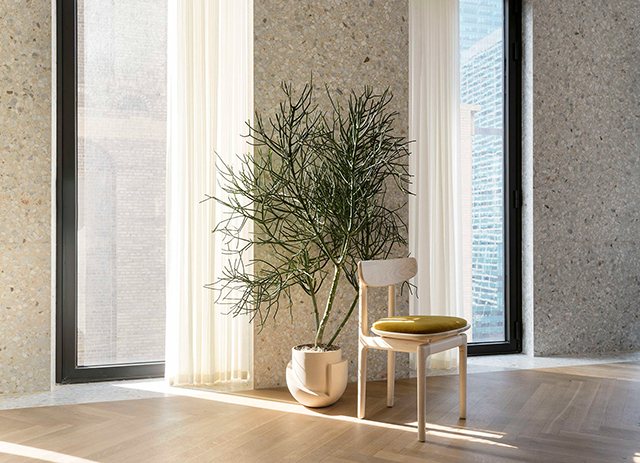 Teaming up with multidisciplinary studio Workstead to co-curate the collections throughout the apartment, they beautifully compliment the architectural features of the space, which includes terrazzo walls and oak herringbone floors. 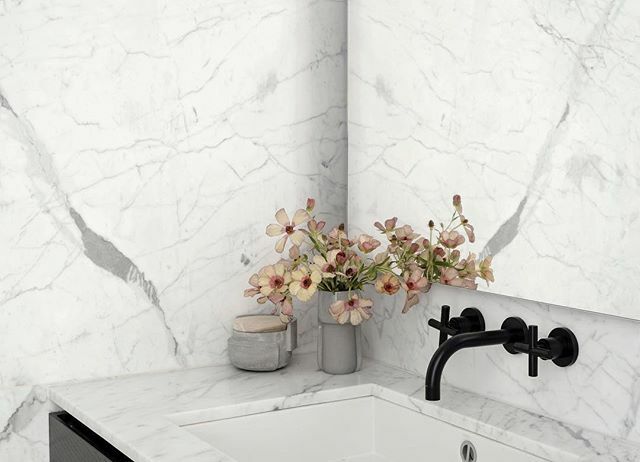 Showcasing works by established design talents, these include Julianne Ahn whose beautiful ceramics I have long admired, Swedish designers Marie Eklund and Oyyo and NYC furniture studio Egg Collective. One of my favourite collections is Bone by Montreal-based designer Loïc Bard. Specialising in the art of woodworking, his work features organic forms that are rooted in the natural environments of his childhood, and inspired by Japanese philosophies of craftsmanship. I have a little bit of a thing for wooden spoons and I would love to add one of these handcrafted beauties to my collection. Designed by Marie Eklund, each one is unique and tells a story. 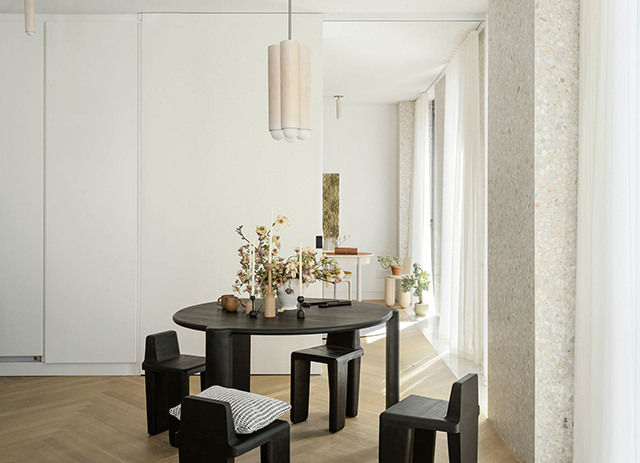 On view during the NYCxDesign bazar taking place 11-23 May 2018, Material Interiors will be showing until the end of June 2018. 0 Response to "Radnor Exhibition At The Bryant In New York"